Last week saw the Fourth "Herbert Anaya" International Congress of Human Rights conducted in El Salvador. The event is named for Herbert Anaya, the head of the non-governmental Human Rights Commission of El Salvador (CDHES) who was assassinated by a death squad in 1987 during El Salvador's civil war. Twenty years after this murder, the crime has never been investigated or prosecuted by the Salvadoran government, part of the legacy of impunity for those who committed war crimes during the civil war. In an article this week, Raul Guttierez at IPS puts this legacy in context. At the conference, a paper from Harvard Law School released earlier this year and titled No Place to Hide: Gang, State, and Clandestine Violence in El Salvador was presented. The Harvard report is recommended reading. It examines not only gang violence in the country, but also the institutional structures which contribute to the level of violence in the country. The recent heavy rains and flooding in El Salvador hit communities in the Lower Lempa region where the Lempa River empties into the Pacific Ocean. US solidarity organizations who work in the region have been spreading the word about the needs of affected families in the region, which go beyond being rescued from the physical danger of the rising water. 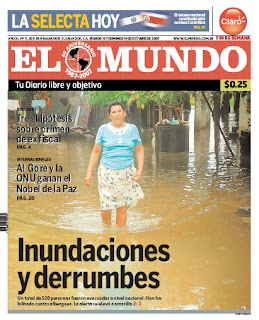 I am sorry to report that the Bajo Lempa is once again flooding - for the second week in a row. I just got off the phone with VOTB staff on the ground who report that the swollen Rio Lempa and more heavy rains are causing even worse flooding than last week. United States Geological Service reports that almost 8 inches of rain fell and that the Rio Lempa rose almost 12 feet in less than 24 hours. The YouTube videos at the beginning of this post are from events which took place in the community Cutumay Camones on Thursday, October 25. In scenes recorded by television news, riot police with shields, tear gas, and rubber bullets confront the local residents who have been protesting a new landfill. Some persons are throwing rocks at the police and burning tires. Three journalists were injured and vehicles damaged. Who was to blame is a subject of dispute. For months now, people in the 11 communities of Cutumay Camones, near Santa Ana, have protested against the decision to construct a new landfill in their community. They believe that the waste in the landfill will contaminate an aquifer which provides drinking water for thousands of families. An article on ContraPunto described a recent reduction in homicides involving women. According to the article, police data indicate that homicides involving women are down this year almost 50% from the same period a year ago. There were 228 murders of women in 2007 through September compared with 421 in 2006. The police and women's advocates have different views on the causes of these crimes. The subdirector of investigations for the National Police, Hector Mendoza, said that the majority of these crimes are linked to gang members. However, Irma Guirola, of the Center of Women's Studies (CEMUJER), asserts that 8 of every 10 murders of a woman in El Salvador involves a partner or ex-lover. ContraPunto is a new Spanish language digital periodical of news and commentary about El Salvador found at www.contrapunto.com.ec. Its editor is Juan José Dalton, son of Salvadoran revolutionary poet Roque Dalton. Plaza of the Americas with Salvador del Mundo monumentCathedral of Santa AnaNational PalaceTheater of Santa AnaMonument to the RevolutionCalvary ChurchNational TheaterClock of FlowersSacred Heart of Jesus BasilicaChurch of CandelariaThere are pictures of each marvel at the La Prensa Grafica site. In my humble opinion, the real marvels in El Salvador aren't the human-built ones. ''We maintain a contingent of soldiers in Iraq . . . as support against terrorism, believing that this will help improve the world, and besides, believing that when you begin a job, you must finish it,'' said Saca, a member of the right-of-center ARENA party. October is supposed to be the last month of the rainy season in El Salvador, but it has had some of the most dangerous rains of the year. The country is currently on yellow alert due to the heavy rains prompting certain rivers to overflow. According to La Prensa, one person died in flooding and 600 people have been evacuated from their homes so far. La Prensa's coverage at this link has several stories as well as photo galleries of the flooding. This map from La Prensa indicates the areas of the country at greatest risk from flooding due to previously saturated soils and high water levels. Update: Salvadoran papers are now indicating that 2500 persons have been evacuated. Two tragedies this week highlighted two endemic problems for El Salvador -- dangerous buses and desperate illegal migrants. Otro autobús en mal estado y un nuevo accidente mortal que esta vez se cobró ocho vidas. Another bus in a bad state and a new fatal accident that this time claimed 8 lives. The bus, in poor condition, was overloaded with too many passengers, mostly women going to work in maquila factories. The bus was traveling at an excessive rate of speed when a tire blew, and the driver lost control. It was a tragedy which was avoidable, and a product of the government's continued failure to enforce minimum standards on older buses which still travel the roads. La Prensa cited government figures showing that 904 persons have died in traffic accidents so far this year. He announced his candidacy to become El Salvador's next president in August. Engineer, businessman and former government minister Arturo Zablah hopes that a political platform which seeks to build consensus in the center, between El Salvador's polarized right and left, can succeed. In an August 2007 interview with El Faro, Zablah spoke about running as the candidate of an "ample alliance of civil society organizations and various political parties." He calls his movement the Alliance for Change, with a motto of "Towards Sustainable Development for El Salvador." He told El Faro that today he has only one objective -- to end the string of ARENA governments. El Salvador's rich folklore is spotlighted in the website named simply Folklore of El Salvador at http://www.folklordeelsalvador.com/. The site has sections on traditional dress, dance, music, and instruments. The site is in Spanish, but even if you only speak English you can appreciate the photos, music downloads and the videos of traditional dance like the one above. The company has 4163 employees in El Salvador. La Prensa Grafica reports this week that Wal-Mart plans to open at least 8 new Despensa Familiar stores a year for the next three years. Despensa Familiar is Wal-Mart's retailing concept where it sells out of small stores, but offering savings of up to 20% due to Wal-Mart's low cost of operations. The intersection points of blogging and journalism are many and varied in El Salvador. Journalists are bloggers. Bloggers write about journalists and vice versa. Although El Salvador is a country where most people can't spend significant amounts of time online, the ever-growing number of bloggers in El Salvador is starting to influence public debate. Discussions about the role of blogs were sparked when the conservative El Diario de Hoy newspaper ran a piece titled Cybernetic Proselytism(es) which warned of supposed dangers from blogs including "disinforming, disorienting and denigrating," all resulting in prejudice to democracy. In particular, the writers of the article warned that blogs were going to be used inappropriately by political parties leading up to national elections. Today is Blog Action Day. Thousands of bloggers across the world have united to post on a single topic on this day-- the environment. With thousands of blogs and millions of readers, the idea is to put a single subject on the world agenda for the day. The challenges faced by El Salvador on environmental issues are great, and I've touched on many of them in this blog. One of the issues is deforestation. El Salvador has less than 2% of its original forest cover. The impact of plantation agriculture, urban sprawl, and poverty has reduced the natural protection to soil and wildlife provided by trees. You can read my posts on deforestation and its impacts at this link. Rains cause floods and landslides in coastal regions of the country. Most affected are low lying areas of Usulután and La Paz. Some 659 persons have been evacuated to 13 shelters. There have been at least two deaths. There is a photo gallery at this link. Rains are expected to continue through Monday. Increased seismic activity has been monitored at Chaparrastique volcano. The volcano near San Miguel is considered active, but has not erupted in the past century. There were similar increases in activity in 2003 and 2004. President Tony Saca announced that he will propose new increases in the minimum wage to take place at the end of 2007 and 2008. The government is currently in discussions with the business sector about the amount of the increases. The minimum wage set in 2006 ranges between $174 per month in the service sector to $81.51 per month in the agricultural sector. National Public Radio in the US had two well-done stories about El Salvador this week. The first story (link) is about the anti-terrorism law and the arrest of the Suchitoto 13. The second story (link) is about migration into El Salvador from Honduras and Nicaragua due to labor shortages in El Salvador caused by Salvadorans migrating to the US. One hundred and twenty five organizations and social movements organized a protest last Friday, October 5 asking for “Blue Democracy”. 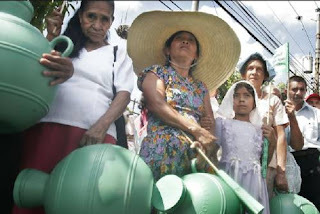 Blue Democracy sums up the Salvadoran social movements’ demands for increased investment in potable water throughout the country, a study of hydric resources, and just water law that benefits the Salvadoran population and protects the resource. Tutela Legal, the human rights office of the archbishop in El Salvador, and the Center for Justice and International Law presented a petition before the Inter-American Commission for Human Rights today. The two human rights groups were denouncing the Salvadoran government for its failure to comply with prior recommendations of the Commission concerning the 1980 assassination of archbishop Oscar Romero. The Commission had previously expressed its view that the Salvadoran government needed to thoroughly, expeditiously and impartially investigate Romero's murder. In a vote on Sunday, Costa Rican voters ratifiedCAFTA, the frequently controversial Central America Free Trade Agreement. Costa Rica will join El Salvador in this treaty with the US which also includes Guatemala, Honduras, Nicaragua and the Dominican Republic. Contrary to the information posted here regarding myself - I did not participate in the training of the Atlacatl Battalion, either at Fort Bragg, NC, or in Panama/El Salvador. I was the Special Forces advisor who reported being shown a guerrilla's skull (at the unit's base in El Salvador) that had been turned into a desk lamp. My report was delivered to the US Embassy in El Salvador at the time through the proper chain of command. Carlos Roberto Silva Pereira, who had been a fugitive from justice since last January, was captured on Friday, October 5, in southern California. Silva was a deputy from the PCN political party in the National Assembly and was wanted on charges of corruption and money laundering. He had made his way illegally into the US before being captured in Anaheim, California. The money-laundering charges stem from a long-running fraud while Silva-Pereira held a seat on El Salvador's equivalent of national congress. According to the country's national police director-general, Silva-Pereira set up a phony construction company that obtained contracts for lucrative projects that were never completed, and pocketed millions. By laundering more than $10 million, Silva-Pereira bought sport cars and even helicopters, while soliciting bribes from many mayors, said Rodrigo Avila, director-general of El Salvador's national police. The area's undisputed high point, in every sense, is Cerro El Pital (Pital Hill), the pinnacle of this compact Central American nation of nearly 7 million. It rises 8,957 feet toward a massive rock dome, which some scientists speculate was formed in prehistoric times by an impacted meteorite. With an average temperature of 60 degrees from November to March (prime tourist season), El Pital offers an escape from the tropical mugginess that blankets much of the country. Although El Salvador has been badly scarred by illegal logging and war-related environmental destruction, El Pital is a haven of lush first-growth forest. This was a rebel stronghold in the war's early years, but it was spared later destruction after initial peace talks in 1984 in the nearby village of La Palma, and the main battle zones shifted elsewhere. Now that the FMLN has decided to have Mauricio Funes as its presidential candidate in 2009, various ARENA party officials are announcing their interest in running on the ticket of the conservative governing party. Ana Vilma de Escobar, Vice President of El Salvador, announcing her interest in running the same day that the FMLN announced Funes as its candidate. Vice President de Escobar worked for USAID for nine years, beginning in the 1980’s. She managed a $50 million project that promoted non-traditional exports, encouraged foreign investment and supported the development of small and medium business as a tool for economic growth. The program supported export-oriented industries and foreign investment in the country. This week the European Union signed a memorandum of understanding with the government of El Salvador in which the EU will give 121 million euros ($160 million) to the country. The funds are designated for use to combat extreme poverty and to improve public security in the country. A report by University of El Salvador released last week determined that medicine in El Salvador costs more than any place in the world. The study evaluated the price of drugs purchased at more than 100 sources throughout El Salvador, split equally between the public and the private sectors. Drug prices for name brand drugs, still under drug company patents, averaged 50 times the international reference price. Generic drugs, while cheaper, were 20 times the international reference price. The price levels made the cost of drugs in El Salvador the highest anywhere. 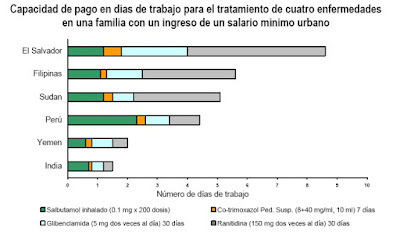 To put this cost in practical terms, the study looks at how many days a worker would need to work at minimum wage in a country to purchase a course of treatment for 4 common maladies. In India, it would take 1.5 days, in the Sudan and Philippines between 5 and 6 days, but in El Salvador it would take a full nine days of wages to purchase the necessary medicines. Train service has returned in a limited fashion to El Salvador. Starting today, a passenger train runs four times a day from Apopa through Ciudad Delgado and into San Salvador and returns. The fare is only 10 cents -- this is designed to be cheap transportation for the poor. One casualty of the re-activation of the train line has been the dislocation of poor families living in shanties along the train track, victims of poverty and marginalization. You can also visit the web site of the government authority which operates this train service.